The “freemium” business model really can work. Look no further than Evernote. When Phil Libin set out to develop the Next Big App, he put forth one cardinal rule: “I didn’t want a clever business model.” Come again? Evernote is a rare exception, remarkable for both the devotion of its users and the slope of its revenue curve. Libin’s two-year-old Web and mobile app bills itself as “your external brain,” letting its 3 million — plus users clip Web articles, take photos, record voice or text notes — and store everything in the cloud. 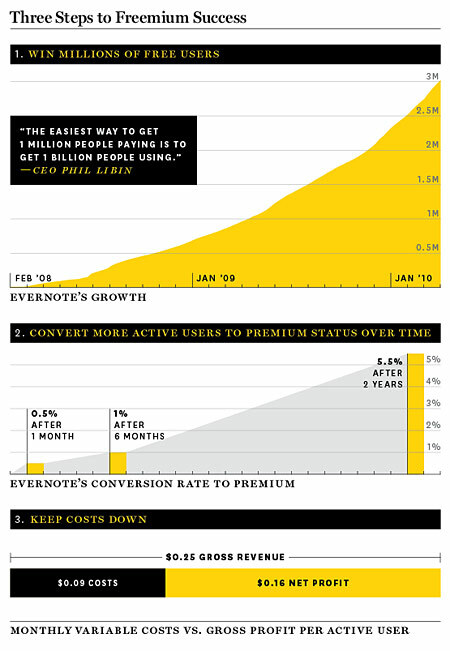 During users’ first 30 days, 0.5% convert to its paid version ($5 a month or $45 a year), which offers perks such as added storage space and offline access. At the six-month mark, the rate has gone up to 1%. After two years, almost 6% of the initial group have started shelling out — and one-third of them are still storing content on a monthly basis.